Hello everybody, my name is Brian, I have been searching several forums for advice on Bandsaws, Jointers and dust collection. Today’s question is about purchasing a bandsaw. I have a 1977 delta with a 1/2 hp motor I got from the original owner about 3 months ago. I have Carter guides, stabilizer for it. I’ve got a Kreg fence for it. I’m using it for small projects and it’s working great. I would like a larger saw with a 12-14” resale ability. I would like to make some nice veneers with it (I love Walnut). A lot of the forums have reccomendations for bandsaws but most are outdated. I originally looked at Grizzly 17” saws with 2 hp motors. Then i noticed a lot of woodworkers preferred saws with at least 3 hp motors. Now I’m looking at Rikon 14” professional saws at around $1500. Grizzly 19” saws and Laguna 14bx, 14 SUV and 18 bx. Mr Iturra from Iturra designs said the new Griizzly saws were good. He said it was nice to buy the larger saws due to the ability to handle larger blades. He also said having a bigger table is nice. I was told to call circle saw in Houston Texas. I heard they were great people with good prices. They sold jet and Rikon and recommended Rikon over Jet. They even recommended I buy the Rikon from somebody else to save on shipping. When it comes to Laguna I like the YouTube videos. They seem well made. I was hoping somebody at Lumberjocks could let me know your experiences with their Laguna. I know a guy at a local cabinet shop that has a Italion made Laguna and he hates the guides with a passion. I’m looking for bandsaws in the $1500-$2000 range. I’d appreciate your advice ? precision resawing is not fun. More like stressful. Agree with LazarusDB. After considering all the choices, I selected the 10-326 and I’m confident I made the exact right choice. Just for clarification bandsaws sized refer to the depth of the throat from the blade to the back of the saw not the height vertically. My 17” Grizzly is actually 16.25” horizontally and 12” vertically. The 2 hp 240v motor has plenty of power to drive the blades it is made to use (1/8” to 1”). It has a large table and a very good fence. I agree with Loren that the wider the board you are re-sawing or veneer making the greater chance for problems. You can only saw as fast as the blade moves and the blade gullets can remove the sawdust so the wider the board the slower you need to run it through the saw. Here is a good video about setting up a band saw. My shop has plenty of 220v circuits and outlets installed. 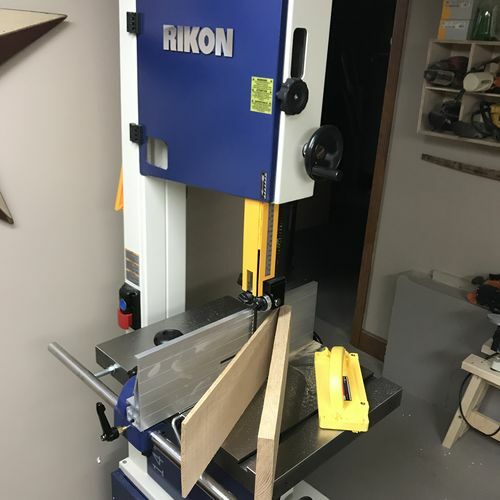 I agree with Loren about the 6” resaw size. I have a 15” Powermatic and I really like it, have you considered this one? One other thing I will add about using a bandsaw to resaw….you really want to get the proper blade for this. While it is possible and certainly many do it with a same blade they use for everything else it is so much better to have the proper blade. While I can resaw much larger boards with mine, I still would rather limit it to around 6”. Anything much over that and it turns in to work. I have to agree with a lot of the comments. 6” max resaw and you will need a good blade. Even a carbide toothed blade although they have wider width. I also have a 10-325 with the new guides and it is great. I have done a fair amount of resawing (6” max) and even some logs. It is slow work. You can not force it or the end product will suffer. a warehouse in the Sacramento area.